Essentially finishing off my purchases from the Card Festa show, let's look at some MLB cards. Most of these were in my last purchase, so it's a good place to stop. First, a single 1989 Topps Mini from 2014 Topps Series 2. For 10 yen (10 cents). If only I could find a whole bunch of these for 10 cents each. Trying to put together this mini set is not easy! From the same dealer, I purchased a large number of 2014 Goodwin Champions singles. There were several short prints in with the regular cards, and they were all 10 yen each! My base set is nearly complete, though I need several SPs. There were several Goudey inserts too. I just bought all of those that were in the box, though I don't think I'm going to put together the set. If you want any of these, we can start a trade. On one hand these are somewhat cool, but not worth building a set of. I also have nine SP extras. They are pictured here and are for trade. This 2011 insert was rescued from the box, but isn't for trade. I might go back and build this set in the future. I did spend a good bit of my money on these four hits. The two Museum Collection cards ran me $3 each, a certainly acceptable price to pay! Ted Williams was $4 and the black (silver?) 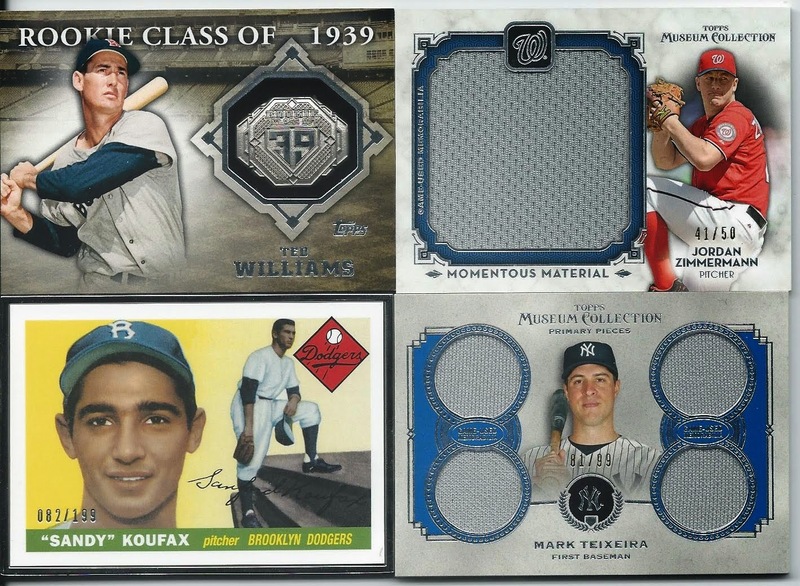 metal Koufax was $6. I'm not sure what these go for on eBay but if you factor in shipping I figure I got a good deal. Of course, attending this show makes me want to come back to the States all the more to go to some good card shows where I can bring back tons of cards. And I just discovered that there is apparently a card show (the winter version of Card Festa) scheduled for December 23rd in the Tokyo area! I'll have to start saving already... and that's right before a major holiday vacation! As I mentioned yesterday, I've been overhauling my type collection lists. The greatest number of missing cards came in the BBM spreadsheet. That probably shouldn't be a surprise, because they put out the most sets and issue the most parallels. Plus, there is fairly complete information about BBM's releases in Issue 104 of SCM (the Japanese equivalent of Beckett, except it's made by BBM - talk about a conflict of interest). 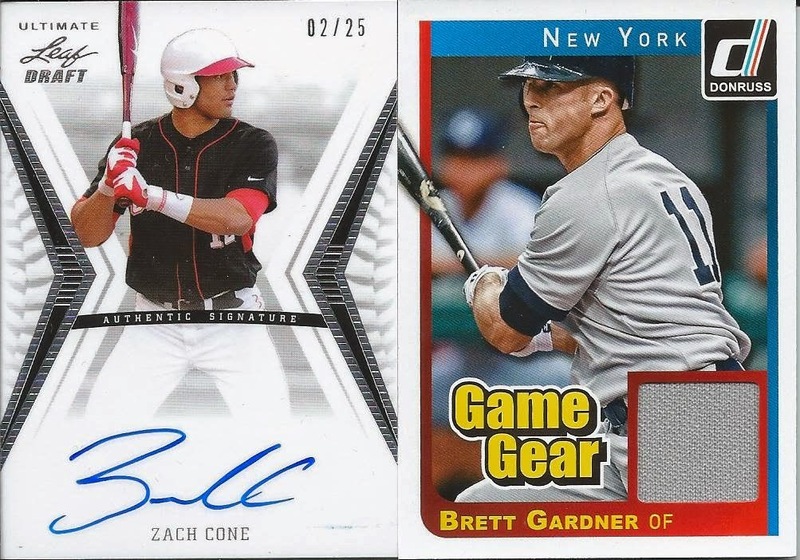 Most of the cards I was missing in the spreadsheet were autograph, memorabilia, or limited parallel cards, though a few sets had slipped by as well. I probably could have done better with BBM at the show, but I did come away with a good number of singles for the type collection. Photo Cards are just very limited cards with a frame on them. I never really studied one enough to be able to tell if the frame holds an actual photographic image (in other words, developed from a negative), or if the picture is printed just like normal (with tiny dots). There are also extremely expensive film cards; I don't have any of those in my collection. Photo and Film cards appear in box sets, though not every box set has them. Gold signature! SCM doesn't have 100% accurate parallel information, especially for 2013-2014. You'd think the issues that have been out for at least six months or so would have a great deal of information - I can understand that it's difficult to find information on the newest sets. But then again, BBM produces SCM, so shouldn't they have all the correct information before anyone else? Don't those two sides of the same company communicate with each other? I somehow missed the Fujinami insert set, but not anymore. I found a couple older BBM Giants inserts for my type collection. And I even found a parallel I had somehow missed before. Genesis is BBM's current high-end brand. They issue only one premium pack-based set per year. This set has all the best relics and autographs, as well as a large number of very limited, very expensive inserts. While there are plenty of box sets that serve as "high end" releases this set is the ultimate. The inserts look the best, of course. Foil printing, different card materials, and just all-around awesome cards. I have seen a few actual inserts but for now they're out of my price range. But BBM issues promo versions of one card from each set. Those promos, too, can be quite pricey, but I managed to get a full set of seven for just 500 yen! Technically, as promos, they probably shouldn't count as cards in my type collection, and they are just "normal" cards as far as printing goes. But until I can afford better, they'll serve as place holders. I've done that with other promos too, namely for relics and autographs. Tomorrow, I'll finish off my card show review with a bunch of singles from the States! MLB, here we come! I've been working on a major update of my NPB lists, which can involve a lot of translating from the SCM guide. Just before the card show, I went through the "modern" Calbee sets to check on all the parallels and insert sets. It turns out there are several Calbee parallels that weren't in my spreadsheets at first, either because they weren't listed in Engel's guide or I overlooked them while making my spreadsheets. Add the separately-numbered checklists to that as well. I haven't added the older-issue subsets though I think I might go ahead and have a comprehensive type collection for Calbee. But, I digress. There were plenty of Calbee cards from the past 15 years or so, including most of the parallels I needed. I didn't scan them, but I found the singles I needed to complete my Calbee Series 1 and 2 sets, except for the Star Cards. I really need to finish the Star Cards, but my card buying has been focusing on the type collection. I also found one old Calbee card for my type collection, from the '78 Pennant Race series. Late '70s Calbee cards are extremely tough to find. I still need a good handful of Calbee cards for my type collection, but I was quite happy with what I found at the Card Festa show. Idol Cards of the Week? A Golden Morning with Morning Musume!